Long running metal icons, CORROSION OF CONFORMITY, will kick off an epic North American live takeover next month. The first leg of the journey kicks off on April 6th in Huntington, West Virginia and will run through April 15th in Poughkeepsie, New York with support provided by MOTHERSHIP. The following evening the band will play a special one-off show with Eyehategod in Richmond, Virginia. Following a short breather, CORROSION OF CONFORMITY will head back out for more than two dozen dates with LAMB OF GOD and CLUTCH. See confirmed performances below. The latest excursions follow the band's successful headlining trek with BRANT BJORK AND THE LOW DESERT PUNK BAND, SAVIOURS and MOTHERSHIP at the close of 2015 and will include some never-before-heard tunes slated for their forthcoming full-length. Comments guitarist Woodroe Weatherman: "We've all been working hard writing and demoing new riffs for the next album but we thought it would be a good idea to jump on the road a bit and let some of these new ideas sink in." 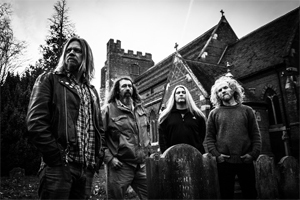 CORROSION OF CONFORMITY have been diligently working on their follow-up to 2014's IX full-length. The as-yet-untitled long player will be helmed by longtime producer John Custer, who has recorded such prior COC classics as Deliverance, Wiseblood, America's Volume Dealer and In The Arms Of God. The record will mark the band's studio reunion with vocalist/guitarist Pepper Keenan and their first full-length record together since 2005. A Fall 2016 release is expected.